Acute hospital trusts in England have significantly reduced their number of chaplains in the last five years against a backdrop of NHS cuts. Almost 40% of the 163 trusts contacted by BBC Local Radio in a Freedom of Information (FOI) request have fewer chaplains than they did in 2009. And nearly half have reduced the number of hours chaplains are on duty. Advocates say chaplaincy services form a vital part of clinical care. Others describe them as a waste of money. The NHS - not religious organisations - has employed chaplains to give spiritual care and support to patients and staff since it was formed in 1948. The Reverend Mark Burleigh, lead chaplain at the University Hospitals of Leicester NHS Trust, said although hospitals were secular spaces, many patients brought their faiths with them. "If the hospital provides nothing for a person who has a religious faith then they're failing that aspect of that person's holistic care," said Mr Burleigh. "If that person's illness is providing them with a religious crisis, or if the person is dying and the family is very anxious that someone should come and say prayers in line with that person's faith, then it is part of the care offered by the hospital to ensure that that happens. "One can't rely on volunteers to come in in the middle of the night to provide those prayers. They need to be members of staff who are trained and equipped and who understand hospitals." Mr Burleigh's trust has cut a third of its chaplain posts in the past five years. He said he recognised that chaplaincy services were not "immune" to the pressures faced by the NHS. Since 2009 the NHS in England has known it's facing the biggest financial challenge in its history, with a plan to find savings of up to £20bn by 2015. Put simply it is having to do the same, or more, with a budget that is not going to keep up with the costs. The health service has had on average throughout its history around 3% real terms increases in its budget. Now it is being asked to become 4% more efficient each year. At a local level hospitals are really feeling the financial squeeze. They are expected to contribute about 40% of that £20bn. Every aspect of hospital spending is being forensically scrutinised, and what's happening with chaplaincy services is part of that. Independent analysis suggests the NHS has made some of the easiest savings first. What lies ahead may be much harder, and no-one believes austerity will come to an end in 2015. "There's no reason why chaplaincy shouldn't make those savings as long as the understanding remains that the chaplaincy service is a valuable part of the clinical care of the patient," added the Baptist minister, who is also the president of the College of Healthcare Chaplains. The BBC's FOI request found there had been a cut of 8.5% - about 1,500 hundred hours - in the total number of chaplaincy hours available in hospitals, with a reduction in almost half of the trusts in England which responded. About 47% of trusts reduced their number of hours in the past five years, but 25% of respondents increased hours. 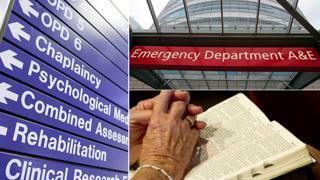 NHS England said hospitals were not obligated to provide chaplaincy services but were expected to adhere to guidelines on meeting the religious needs of patients and staff. "There is no statutory requirement for hospitals to provide chaplaincy services, unlike prisons and the armed services," said a spokesperson. "Since responsibility for the service has been transferred to NHS England we are currently reviewing the service, however it is still a matter for individual trusts and faith leaders as to the level of service provided." Vanessa Williams' son Gareth was five when he was diagnosed with an inoperable brain tumour at Sheffield Children's Hospital in 1997. He died six months later. "If you have a faith, you do need some guidance there," she said. "You can't find it in your own strength at a point like that in your life, when you've just heard this horrible news that your son's going to die and although they've got all this wonderful medical technology there's really nothing they can do." The National Secular Society (NSS) has campaigned against taxpayer-funded hospital chaplains and believes the present system leads to unequal care. Canon Chris Davies has spent 36 years as a hospital chaplain. "I think because we have become a much more secular society, people are far less involved in what I would call institutional religion," he says. "Yet people are still trying to make sense of why they are suffering, or why their loved ones are suffering, why they are dying or why their loved ones are dying, or why their loved one has died." Do chaplains offer 'incredible value for money'? President Terry Sanderson said NSS research suggested the NHS was on the verge of employing more chaplains. "We found that although there had been redundancies in some areas and reductions in some areas, overall there seems to have been not much of a change in the actual amount being spent on chaplains in the health service since we did our own research in 2009." In 2009, the NSS contacted 233 acute and mental health trusts and found they spent a total of £26.72m on chaplains, at an average of £48,953 each. He added: "If you look at the situation overall in the health service with the huge number of redundancies among front line staff, it does make it hard to justify the health service paying for chaplains' salaries. "There must be other ways of doing this. "If the churches and other religious bodies think chaplains are so important really they must make some other arrangement."